I just want to know the truth about butter! Despite some bad press, there’s evidence that it could actually be good for you. Get a brief lowdown with our list of reasons why and learn the benefits. It has just two ingredients! Yes, two! Butter contains cream and sometimes salt. Finally, ingredients we can understand. Contrast this to the chemically derived margarine process in the graphic on the right and the butter vs. margarine debate is quickly laid to rest. An excellent source of vitamins. Butter is a good source of the fat soluble vitamins: D, A, K, E.
Trace minerals are found in butter such as manganese, chromium, zinc, copper and selenium, which is incidentally, a powerful antioxidant. Perfect balance of omega-3 and omega-6 fats. 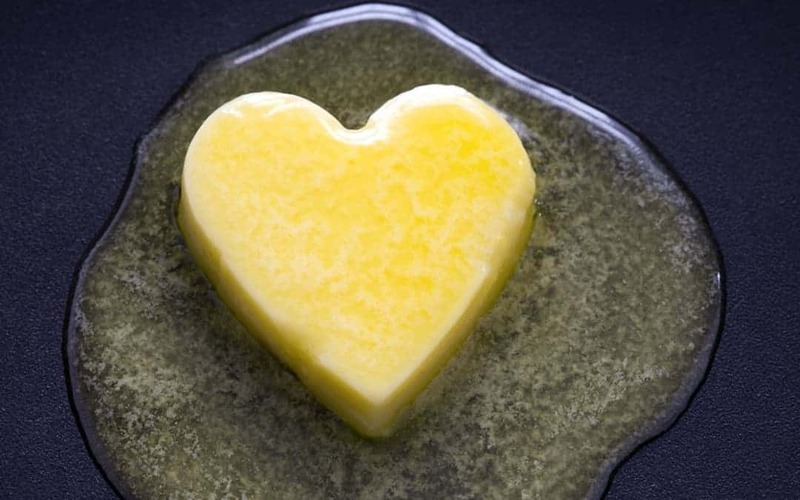 The arachidonic acid found in butter may help with brain function, skin health and prostaglandin balance. It is an excellent source of good cholesterol? If you thought cholesterol was the enemy, then think again! Cholesterol is needed for healthy cellular function. It also plays a part in brain and nervous system development. When buying butter, it is very important to select organic butter made from the milk of grass fed cows. This is especially important for ensuring you get more of an omega-3 boost and less omega-6 (from grain fed cows). An even better option is to head to your local farmer’s market and look for raw butter! Melt 1 1/2 cups of the chocolate and spread it thinly and evenly over the wax paper. Stick it in the freezer for a half hour. While that’s in the freezer, combine the cookie batter, powdered sugar, and butter. Pull the chocolate out of the freezer, spread the cookie butter mixture over the frozen chocolate. At this point you could throw it in the freezer again. Melt the remaining chocolate and spread it evenly over the cookie butter mixture carefully so as to make a smooth layer without mixing in the cookie batter mixture. Top with the salt, you may not need the full 1 tsp. Alternatively you can experiment with pink salts or sea salt. Stick the whole thing in the freezer again. Let freeze overnight and it breaks up very nice!